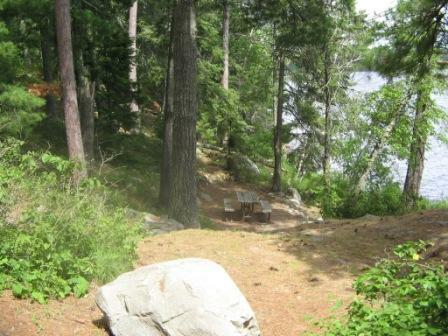 This relatively unused park is on highway 71 between fort Francis and Kenora. We stayed here a number of years ago, and we were surprised at how the trees have rown since we wrere here before. We made the move to Quetico for an overnight stay, we have't been there for over 10 years. 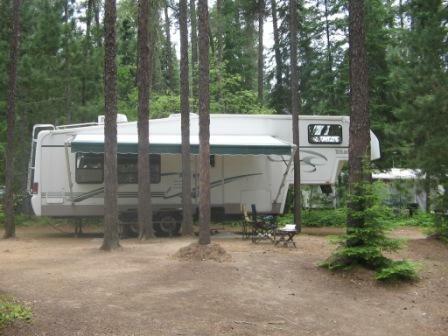 The park has a number of seasonal campers in the Dawson campground, this seems to be helping to improve the usage of the facility. There already are a large number of people canoeing in the park, from the quantity of cars in the lot at the canoe launch site. We are back in Thunder Bay, getting provisions in preparation for heading west, we will probably be in Quetico Provincial Park tomorrow. 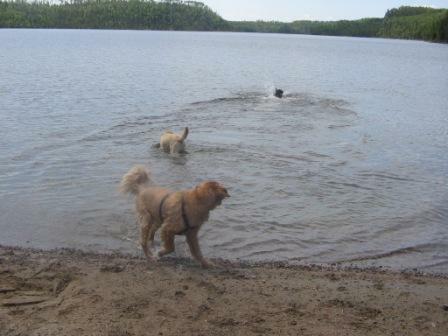 Today it is quite warm, a great day to take the dogs over to Mackenzie lake to cool them off! Kasey is showing his fine swimming style! We made it up to Armstrong Station (about 240 Km. north of Thunder Bay), and we are tucked into our daughter and son-in-law's driveway. We plan to be here for a couple of days, enjoying the countryside and the pleasant company. We had a great campfire in the evening, the bugs were kept at bay with quantities of DEET. 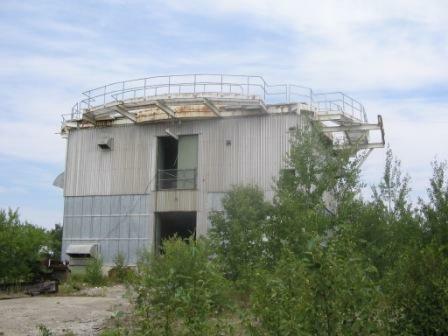 Armstrong was the site of the Pinetree defense system after the second world war ( the forerunner of the Dew Line), a radar base set up to detect Soviet bombers before they entered southern Canadian/American airspace. 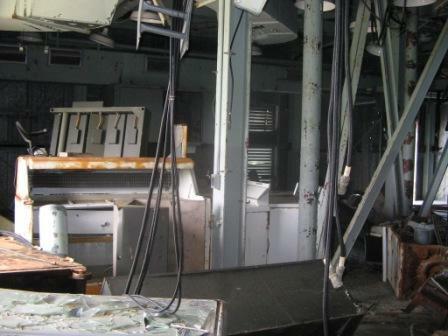 An interior view of some of the "electronics" under the top of the radome. 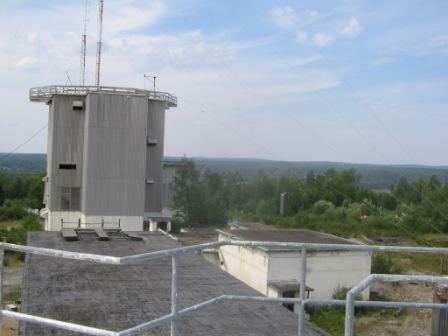 It's amazing how large the electrical panels were, before the time of integrated circuits and transistors. I'm not sure what happened (blame Bill Gates!) 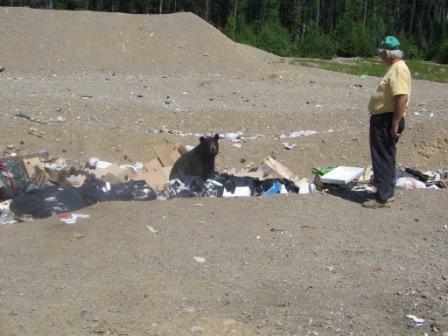 but all the web pages prior to Pakaskwa disappeared, and I broke the cardinal rule (save, save, save!). 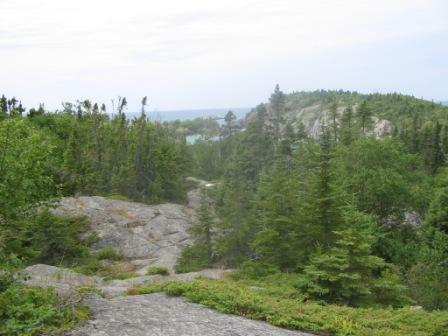 Oh well, if anyone needs info on the provincial parks that we visited, pease ask! We are spending a night here! The good news is that there are no bugs to speak of, the bad news is that we are in between the Trans Canada highway and a main rail line, so it's not the quietest place on the planet.We provisioned in Thunder BAy, and tomorrow we head for Armstrong. We look forward to the visit! We arrived at Pukaskwa just before noon today. 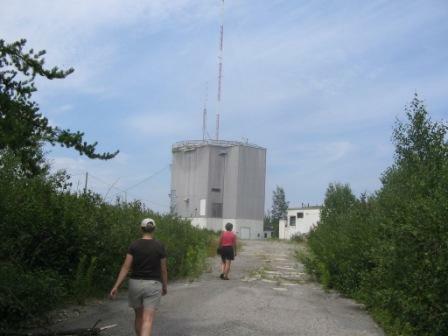 Unfortunately, we could not get a clear shot at the satellite, so this post is being included from Thunder Bay. There are about 4 other campers here, and 2 new trainee park attendants. 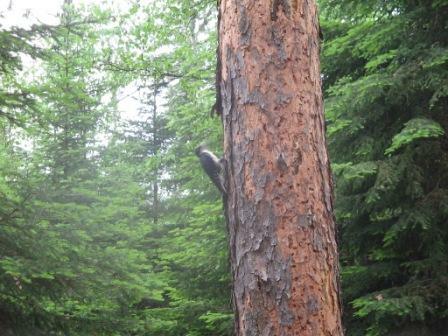 The temperatures have increased and in the trees, there is little wind. 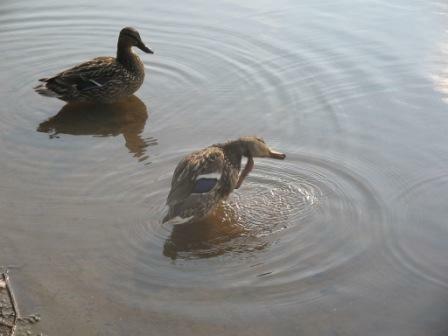 Occasionally, cool drafts come off the lake, keeping the mosquitoes at bay. We wanted to take the Halfway Lake trail, but blown down trees and staircases that moved off their foundations during the winter prevented us from taking it. 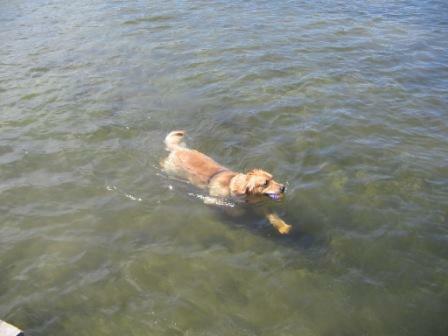 Instead, we spent some time on the beach, and Kasey enjoyed his usual swim in the +4C water! 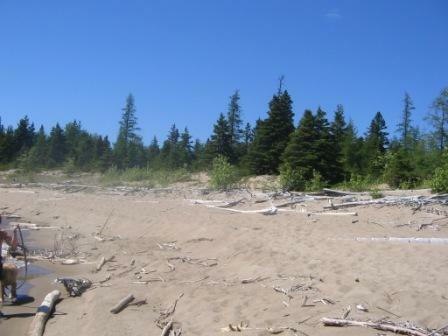 The north shore of Superior is rugged and unspoiled. The driftwood comes in and piles up on the shore, making great raw material for kids to make forts with. 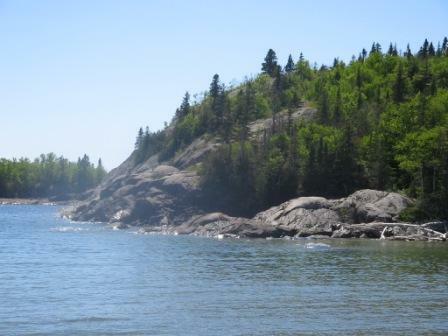 The rocky shoreline is beautiful; Pukaskwa has some trails over and around these rocks. 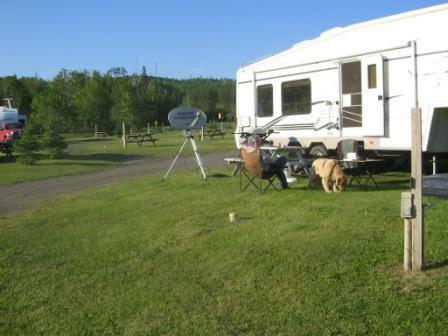 We are off to Thunder Bay to spend a day at the KOA, after that, we head for Armstrong to see Cam and Chantal.